Sand storage bins are available in a wide range of sizes from 8’-0” to 18’-0” diameter, and capacities ranging from 50 to 400 ton. 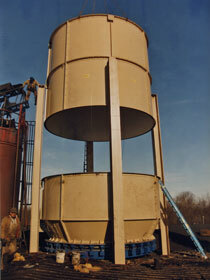 Round sand storage bins promote sand flow and they are economical to fabricate. To insure “First In First Out” sand flow in return sand storage bins, a near full diameter bin discharger is fitted to the bottom of each bin. Return sand storage bins are fabricated from 3/8” thick plate with structural beam columns and special epoxy coating on the bin interior. New sand storage bins are custom designed and fitted with anti-segregation tubes to a bottom collecting point to insure uniform flow and maintaining consistent grain size. "Summit Foundry Systems." 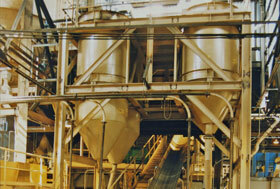 Summit Foundry Systems. N.p., n.d. Web. 15 Jan. 2013. <http://www.summitfoundrysystems.com/StorageBins.html>.